Dr. Bryan Deloney, B. Sc., MSHNFM, D.C.
Dr. Bryan Deloney was born and raised in the St. Louis area. 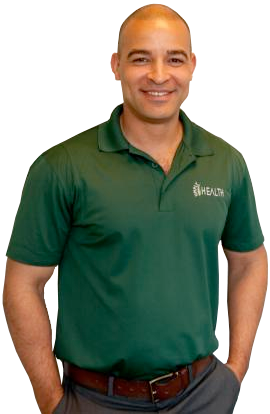 He holds a Bachelor’s of Science degree in Human Biology from Logan University in Chesterfield, MO, a Master’s of Science in Human Nutrition and Functional Medicine from the University of Western States in Portland, OR, and a Doctor of Chiropractic degree from one of the top accredited chiropractic schools in the world, Logan University in Chesterfield, MO. Dr. Deloney has currently completed more than 5,600 hours of nationally accredited education and has successfully completed parts I, II, III, & IV of the National Board Examination as well as the National Physical Therapy Board Examination and the Missouri State Board Examination. During his professional internship he completed clinical rotations at multiple outpatient care clinics throughout the greater St. Louis area which included volunteering over 100 hours at the St. Pat’s Shelter and Free Clinic for impoverished and poverty-stricken patients. While completing his graduate work Dr. Deloney also served as President of the Maximized Living Student Program for nearly two years. While serving as President he was responsible for learning and instructing the many aspects of becoming a Maximized Living Doctor and running a high volume, patient- focused health center. Dr. Deloney has previously worked in the largest chiropractic practice in the mid-west under Best-Selling author Dr. Charles Majors as well as the 2nd largest practice in the state of Florida under Dr. Greg Loman. Dr. Loman is the owner and founder of an international network of chiropractic wellness doctors called Maximized Living, as well as a multiple New York Times Best-Selling author. Maximized Living is involved numerous national and international programs (described below on pgs. 2-3) and has published more than eight different books on health and wellness with some reaching the New York Times Best-Selling and Christian Best-Selling lists. Dr. Deloney is certified to practice pediatrics through the post-graduate department at Logan College of Chiropractic. Dr. Deloney completed a Master of Science degree in Human Nutrition and Functional Medicine through the University of Western States. Functional Medicine addresses the underlying causes of disease, using a systems-oriented approach and engaging both patient and practitioner in a therapeutic partnership. It is an evolution in the practice of medicine that better addresses the healthcare needs of the 21st century. By shifting the traditional disease-centered focus of medical practice to a more patient-centered approach, Functional Medicine addresses the whole person, not just an isolated set of symptoms. Functional Medicine practitioners spend time with their patients, listening to their histories and looking at the interactions among genetic, environmental, and lifestyle factors that can influence long-term health and complex, chronic disease. In this way, Functional Medicine supports the unique expression of health and vitality for each individual. Functional Medicine incorporates the latest in genetic science, systems biology, and understanding of how environmental and lifestyle factors influence the emergence and progression of disease. Dr. Deloney’s ongoing continuing education includes advanced training in spinal correction, toxicity, exercise and nutritional sciences. Dr. Deloney enjoys volunteering at a number of local charity fund raisers and children’s programs whenever possible as well as traveling to volunteer on multiple health care relief mission trips to Indonesia, Haiti, and the Dominican Republic.